Today we have an epic thank you card by Larissa! 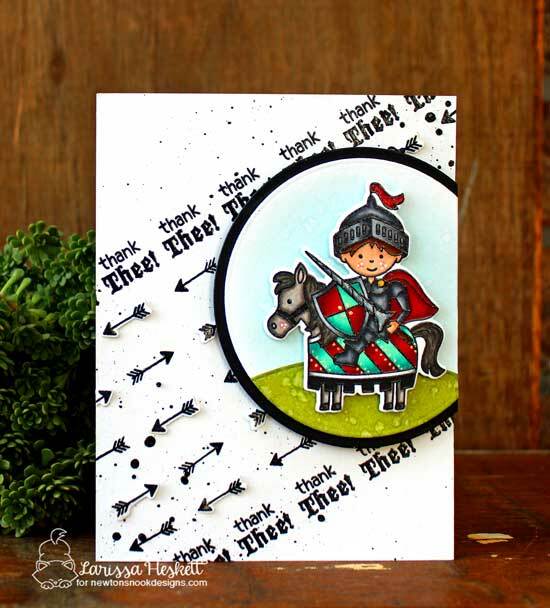 She created this awesome card using our Knight's Quest Stamp Set. She stamped the adorable image of the knight in shining armor on his horse and colored it beautifully! The red and bright teal colors on the shield and horse robes are so pretty! Then she trimmed out the knight image using the coordinating Knight's Quest Die Set and added him to a little scene inside a circle. She added a little hill too using our Land Borders Die Set. The background on this card is so awesome too! She stamped a bunch of little arrows, also from the Knight's Quest Stamp Set and die cut them out to add them onto the card in a fun diagonal pattern. She also added the "thank thee" sentiment repeatedly! This background is so fun and bold! What a unique way to tell someone thank you!